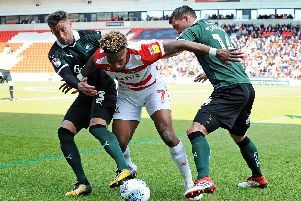 Darren Ferguson has called on his Doncaster Rovers players not to let their standards drop as they look to build on an impressive eight-match unbeaten run. Rovers kickstarted their season with a hard earned 1-0 win at Bristol Rovers, their opponents this weekend, last month. They have since distanced themselves from the League One drop zone and moved up to 11th in the process. Having come from behind to rescue draws at high-flying Shrewsbury Town and Scunthorpe United in their last two matches, a team that were too much of a soft touch earlier in the season have been rightly lauded for their resolve and fighting spirit. Ferguson, however, is honest enough to admit that performance levels have dropped and is keen for that trend to be reversed against a Pirates outfit also unbeaten in their last five games. “If you’ve watched us through the course of the season, I would agree with you that there’s been a gradual improvement,” Ferguson reflected on Rovers’ return to the third tier. “I think we’ve shown a resolve to us that I’ve been pleased about. “But clearly if we win on Saturday we get to 40 points from 30 games. Given where we were before Christmas, you would’ve taken that. “It will be a good return with 16 games to go, and you’re probably around the middle of the table. “Before Christmas we were 18th or 19th so we’ve certainly done well over this period. “But I do believe that we need a performance on Saturday far better than what we’ve been getting. Having drawn their last four league games, Ferguson added: “It’s all well and good saying it’s an unbeaten run, which is great, and we don’t want to lose games. Missing influential centre back Andy Butler through injury, Rovers were almost made to pay for a very nervy opening to the game against Scunthorpe on Tuesday night, only for youngster Alfie Beestin to bail them out deep into stoppage time with his second goal in three games. Ferguson admitted his side ‘got away with it’ against their local rivals. “I wasn’t happy with the performance,” he said. “A lot of things we worked on, we didn’t do well enough. “We weren’t brave enough. Watching it back, we weren’t brave enough on the ball which caused us a problem, it allowed them to press us. “But credit to my players again, we showed a good resolve. “We can’t get away from the fact that the players have to understand that we got away with it on Tuesday. “We have to have better performances than what we showed on Tuesday and certainly the first half against Shrewsbury. “The players are fully aware of that. After impressing as a 12th minute substitute for hamstrung centre back Mathieu Baudry, Craig Alcock is in line to make only his second league start of the season tomorrow. Tyler Garratt is pushing for a start at left back after setting up Beestin’s dramatic equaliser.